This is easily one of the most gorgeous styled shoots we've seen yet. Jenna Brianne was inspired by a English Garden Party, and every single element, from the bride's silver-blue dress to the heirloom jewelry, ties in beautifully. We love how every detail stands on it's own, but overall, allows the bride and groom to be the spotlight. Feminine, sweet and completely timeless, this shoot is certainly one to save for your own wedding inspiration. From Jenna: This wedding inspiration shoot brings to mind visions to a romantic English garden party. The soft pastels, lush gardens, and rolling hills are not only incredibly romantic, but classic and timeless. The bride's silver-blue Truvelle wedding dress, with the jewel encrusted bodice, is so stylish and so perfect for such a stunning setting. The hair and makeup was kept soft and delicate, and the florals lush and loose. 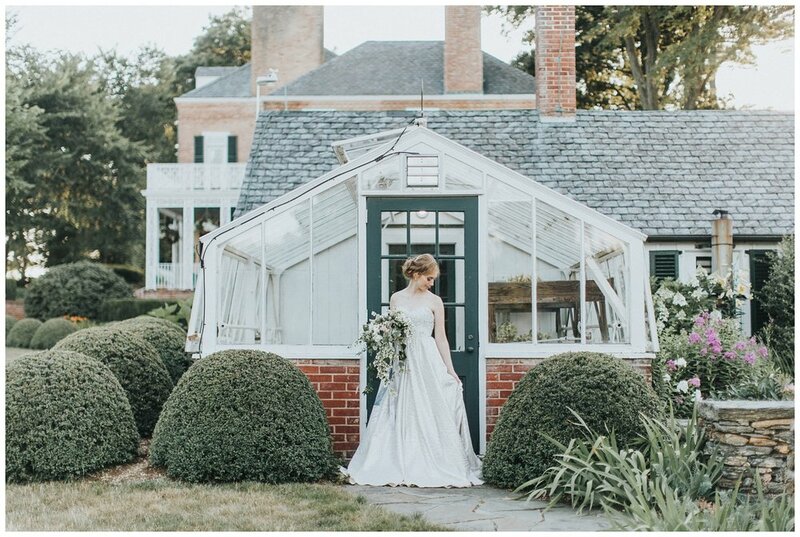 While the entire inspiration shoot has a sweeter and more feminine look to it, we stuck to blue and neutral tones to complement the greens of the garden and surrounding land. Oh friends, we've been giddy to share this post with you for WEEKS, and today is the day! Have you ever wondered what happens when a wedding photographer becomes the bride?! After years of being behind the camera, Kerri of Kerri Lynne Photography is marrying her adorable fiancé Derek, and is now the one planning HER dream wedding. The lessons she's learned as a bride-to-be are priceless, and more importantly, are a wonderful reminder to slow down and enjoy the journey. We adore Kerri, her outlook on her wedding day, and her commitment to a beautiful marriage... and we're counting the days until we get to see her say "I Do!". Blogger Bride Kristen of Maid of Henry • You're Engaged! What's Next?